Search for Destin online, and some of the most popular images will be white-sand beaches. After all, Destin, Florida, is home to some of the most stunning beaches on the planet. No trip to Destin would be complete without spending some time kicking back on the sand and soaking up the sun. However, that's not all Destin has to offer. Take a closer look at what exists beyond the beach as you plan an unforgettable trip to Destin. As a beach destination, Destin is pretty new. However, the area's history goes back way, way further than the first beachfront hotels. Fort Walton Mound is a testament to the region's historic roots, and it is an incredible place to explore. The archaeological site and National Historic Landmark is just outside of Destin, and it dates back to the ninth century. That means that the site is a staggering 1,200 years old! The large mound, a kind of precursor to a pyramid, was built by the Pensacola people. Nearby, the Indian Temple Mound Museum offers more exhibits and over 1,000 artifacts from European Explorers, early settlers, and local pirates. Whether you're looking for shopping, dining or entertainment, Destin Commons has you covered. This enormous, outdoor and pedestrian-friendly complex is a fun way to spend your time in Destin. Dozens of shops beckon, and there are places where you can grab a souvenir or shop for a new bathing suit for the next day's adventures. There are plenty of restaurants and bars to choose from, letting you dig into tasty cuisine in between shopping. Plus, there is even a movie theater where you can cool off after a day in the sun. Although Destin's beaches are definitely family-friendly, there are also plenty of fantastic attractions on land that the whole family can enjoy. 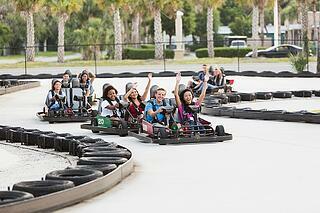 At The Track Family Fun Parks, there are countless ways to get the adrenaline flowing and have a memorable time! Go-karts are one of the top ways to have a blast at The Track, but the thrills get even bigger if you're looking for a rush. You can try out the Sky Flyer, which replicates the excitement of skydiving in a safer environment. You will also find bumper rides, miniature golf, and a range of rides and attractions for younger children. One of the great things about Destin is that it boasts all types of outdoor adventures. If you're eager to explore the natural side of this destination, you can escape the crowds and check out the Mattie Kelly Park and Nature Walk. This bayou access park is just 10 acres, but it is an escape from the hustle and bustle of everyday life. Two wooden boardwalks let you soak in the scenery over the wetlands or right over the water. You can even fish from one of the boardwalks, or you can bring along a picnic and relax in the beautiful landscape. To truly make a memorable experience while you’re in Destin, get off the beach and into the water. Chartering a double-decker pontoon boat in Destin means that you can see the destination in a whole new way. You can even venture out to some areas, like Crab Island, that are inaccessible unless you're on the water. A double-decker pontoon boat is your own private escape for the day. Head out from the harbor and look for the dolphins that love to play in the wakes. Bring along a snorkel, and you can dive into the water near the East Jetty to look for underwater marine life. Make a splash courtesy of the unforgettable waterslides off the top deck. Destin's beaches are fantastic, but there is so much more waiting for you to explore. At Double Fun Watersports, we can help you make the most of your time in Destin, Florida. Charter your double-decker pontoon boat today!